Added Drawing Setting to disable progress bar to increase drawing load speed. Fixed issue with CMS New Backbone from Available. Fixed issue with (,) decimal separator used in the single line of text editor rotation property causing incorrect text rotation. Fixed issue with (,) decimal separator used in the MText editor rotation property causing incorrect text rotation. Fixed issue with Rotation editor in ribbon menu losing value on lost focus. Added Export to Excel function to the command line shortcuts settings page. Fixed Fillet All Cables on Ratsnest only filleting the first cable on some drawings. Fixed Assigning SysName to front panel in Rack Builder built drawings throws exception if the HASHES layer is frozen or off. Fixed issue with auto-indexer failing when encountering a specific cable type. Fixed issue with New Layout name dialog allowing illegal characters. Modified the delete function to honor the AllowDelete permission for assigned cables but allow delete of unassigned cables. Modified the delete function to honor the AllowDelete permission for assigned SysName on equipment but allow delete of unassigned equipment. Added a Create Security database function to the settings dialog. Fixed issue with AutoBlock tool not honoring the signal types selection if not pulling from Cables table. Added splitter bars to the preview pane in the Equipment Library for better high res experience. Fixed issue downloading from community with an empty project signal types database. Fixed issue [Normal bug] System don't get system prefix if added via assign terminals. Fixed issue SysName assignment dialog not autosequencing when launched from the EquipmentList>New function. Fixed issue SysName Assignment dialog not reverting next number when the dialog is canceled from Equipment List>New and Assign Terminal>[+]. Fixed issue on high res systems with columns in some grids not auto-sizing to the correct width. Fixed issue Project Signal Types Ripple continuing with Ripple when the Ripple is refused. Fixed issue rippling Cables into some drawings that are closed. Fixed issue with the Edit Attributes dialog not showing the edits unless Regenerate is called. Fixed issue with New Report Wizard throwing exception with select presets. Fixed several issues relating to hi-res displays and objects not displaying correctly. Added Disable Natural Sort application level setting. Use this to load large data sets faster. Fixed issue with BOM Equipment filter when filtering against CreatedBy. Fixed several issues with Cable Number Format tool dialog. Fixed several issues with SysName Format tool dialog. Fixed AutoBlock tool not showing ports in default mode with all Signal Types selected. Fixed move grips on cables not working well. Fixed move assigned cable to new port two times causes Cable Number text entity to jump away. System.InvalidCastException in Rack Builder on some systems missing Front Panel File. Fixed cable numbering bugs on some systems where the User Coordinate System is not coincident with the World Coordinate System. Removed calls to Regen for many functions in order to speed up the application on very large drawings. Fixed Equipment Library Find Grid columns swapping positions. Modified the Equipment Library Find grid to remember column positions. Fixed User Defined Shape files in the Equipment Library randomly showing Terminals instead of selected UDS. Fixed User Defined Shape files not honoring IO list order. Fixed Cable# text not updating when the User Coordinate System is not coincident with the World Coordinate System. Fixed Move Insert with Wires not moving cables when the User Coordinate System is not coincident with the World Coordinate System. Fixed Link Pointer operation fails to update one or both pointers when the User Coordinate System is not coincident with the World Coordinate System. Modified the Move Insert With Wires to be faster. Fixed multi-relational cable edit updates wrong text on some systems. Fixed Swap Cable Direction function not working on some systems when the cable is unassigned. Fixed Import Project Data Wizard to honor the [Parse the Elevation from the location fields] checkbox uniformly. Fixed [Repair Equipment List] from the project Cables grid not transferring elevation and alias fields. Speed optimizations in the AutoBlock tool. Speed optimizations in the Ratsnest tool. Faster Move Insert with Wires function. Fixed OnLayer not transferring from default signal types to project signal types when using the Get Default Signal Types function in the Project Signal Types grid. Modified the Link Pointers function to optimize linking on the same sheet. [Shift] + Double-click is the same as selecting (This Drawing) but without showing the Drawing Select form. Fixed the drawing View>Activate Viewport function to both activate and de-activate the selected viewport. Added config settings to disable performance counter usage and logging system. This is used as a troubleshooting technique on systems that WireCAD won't run on due to the system Performance Counters not being loaded. Fixed right-click error on polylines that are not cables. Fixed Quick Ripple failing on SQL databases. Fixed Equipment Library grid refresh on Win10. Modified the Equipment Library File>Save As ... function to automatically reload the grids to show the new record. Removed the "Show Again" checkbox from the New Drawing Wizard. Fixed issue with bulk cable assignment where the first cable in the selection set is an assigned cable. Fixed issue with context menu on cable throwing exception on some drawings. Added Show Me menus to the right-click menu in the drawing for equipment. This will allow you to jump to the other instances of that device throughout the drawing set. Fixed issue with Quick Ripple and changing equipment manufacturer and model on some systems. Fixed issue with Equipment List menus in Spanish on some English systems. Fixed issue with color selection dialog not resizing properly on some system. Fixed issue with Rename Signal Type IO function on some systems. Modified Rename Signal Type IO function to provide better feedback to the user. Fixed issue with Project Signal Types ripple operation throwing exception when Linetype is null. Fixed CMS Export Selected Circuits not honoring MergeAndCenter setting. Fixed issue with non-English new installs failing to find the public WireCAD folder during startup. Fixed error with some systems trying to persist the drawing while linking pointers caused exception with the settings file. Fixed error with some systems clicking [Esc] with no drawing open threw exception. Faster settings dialog load times. Minor cosmetic changes in the IO grids of the Equipment Library. Fixed null reference exception when SaveAs drawing outside of project. Fixed Slurp SysNames to SQL database not updating new slurp locations table function. Minor bug fixes in the indexer functions. Fixed SRCAlias field and DSTAlias field not updating with new port info when a cable is moved from one block to another. Modified the Next Numbers grid to show the filter pane. Fixed Block Descriptor Locations (...) button not showing in Library. Fixed Body Color property throwing "The passed color's palette is empty" when the Equipment Library is open outside of project. Added support for rippling project Signal Types across drawing set. Added support for faster grid rendering throughout the application on systems that support DirectX Hardware Acceleration. This is automatic. If your hardware supports it your grids will render faster. Modified the Rack Builder tool to persist changes in rack height and slot count across sessions. Fixed: Unable to assign cable numbers to certain pointers. If the drawing names ended the same, e.g. "audio.dwg" and "av_audio.dwg" the pointer link would work but the cable would not assign. The recent release of WIN 10 Creators Build has broken WireCAD on some systems. Version 9.2 addresses issues specific to this error. If you are experiencing the application hang as a result of changing a property with a dropdown list after installing the windows update. This is for you. Fixed Map tool Display>Reset All throws exception if pressed before having something to reset. Modified the SDK examples and template installers to reference the new assemblies. This version will break your plugins that reference the DEVEX 16.2 assemblies. You will need to recompile against v17.2. If WireCAD has created a plugin for you, you can request that we recompile it for you. There is no charge for this service but requests are handled on a first-come-first-served basis. We will not automatically recompile for you. You must request it. Fixed Object Reference error when changing PenColor on multiple entities. Fixed move cable end point does not honor OSnap Settings. Fixed New button in SysName Assignment dialog without Make and Model throws exception. Added Remove VIA function to the Backbones grid. Fixed Map tool Copy Coordinate To Clipboard is copying the coordinate reversed from the Geo-referenced DWG Copy Coordinate to Clipboard function. Fixed ID GPS Coordinate Tool throws exception when selecting the filter row. Fixed issue with delete drawing function throwing path not found error. Fixed Verbose cable number assignment not informing of duplicate cable numbers in same project. Fixed issue dropping adapter in drawing not on a connection point throws error. Modified the Select Drawing function's Show Open Drawings Only checkbox to honor the current user's open drawings only not all open drawings. Also persisted this checkbox across user sessions. Fixed issue with Edit Block in Place throwing exception on first run if Equipment Library has not yet been shown. Fixed issue with terminal drawing not honoring port signal type colors. Fixed issue with Equipment Library not loading properly if Disable Form State Tracking = true. Fixed issue Assigning Planview Cable not creating optional Named Path if Named Path field is entered. Fixed rereference pointers not sorting drawings. Modified the Close All Drawings function to use the SaveAll dialog. Modified the Close All, Close Others, Close All Unpinned, Close Others Unpinned to use the SaveAll Dialog. Fixed exception thrown by delete command initiated then cancelled with Esc key. Fixed issue with Edit Block in Place not honoring Ignore Cable # Text Color setting. Added context menu items in the Project Explorer to Open Drawing and Open Drawing Read Only. Fixed PatchVerx plugin not registering on some machines. Fixed Project File Path & Database file location browser isn't opening the current given path. Modified the SDK on the New Equipment Wizard to allow preset values. Modified frmNewManufacturer.ManufacturerItem to be a public property to allow preset values. Fixed SysName Assignment Dialog when used with undefined manufacturer and model throws exception. We have changed the name of the ENT product level to better suit its functionality. Many potential user were getting confused, assuming that only the ENTerprise product level was multi-user. The new product level is called CMS for Cable Management System. Layers dialog not allowing cancel if the cursor is on new layer textbox and the textbox is empty. WireCAD ENT now supports Blind Patches. Modified the grid forms to be more responsive. Optimized the natural sort algorithm for faster sorting on large datasets. Modified the text editor's Height property to work in 1/100th DU to eliminate the decimal separator issues. Modified the MText editor's Height property to work in 1/100th DU to eliminate the decimal separator issues. Fixed issue with renaming IO Signal types from the Global Signal Types grid. Fixed issue with upgrading v6, v7 SQL projects not properly displaying drawings. Added an advanced project setting to allow user control of the Cable Number Text placement and Search Window. This allows you to adjust where the Cable Number Text is placed and to modify the search window width and height so the text can be found in its new position. This also allows for the creation of blocks with vertical pin spacings of < 1 to be created without any adverse side effects during Cable Number Assignment. Fixed issue with the CheckedOutBy field in the Project Explorer not showing data. Modified and reworked the Single Line of Text editor. Added a MText editor instead of the inplace editor. The new editor now supports MText formatting codes. Read only drawings can now be panned with the mouse wheel. Fixed issue some drawings opening read only when not checked out. Modified read only drawings to support print preview and pdf export. Fixed Cable No Assignment dialog to accept decimal lengths. Fixed some issues with WC3_Pointer_D_v2 not aligning properly. Fixed issue with not being able to add new folder under root drawings folder in the Project Explorer. Modified the way the auto indexer behaves. It no longer works with VISTADB projects where it was causing too many concurrency errors. Added a new setting to Disable SysName Edit Dialog Edit Mask. This allows you to override the SysName Format Tool and enter unformatted data in the SysName field. Modified the Rack Builder built drawing informational text behaviour. Instead of opening the Equipment Library it now opens a file selector dialog to save time. The missing Front Panel file text now updates the drawing with the selected file. Fixed installer creating broken link to old demo project. Added OSnap menu to status bar. Fixed Project Explorer not sorting folders and drawings under certain conditions. Fixed issue with packup and go syncing SQL to Vistadb. Separated the delete ports buttons. Added Delete Selected Inputs and Delete Selected Outputs buttons in the Equipment Library I/O page. Added a new Archive tool (PRO/ENT). This tool create archives and revisions concurrently. Fixed issue creating new folders in sql projects. Fixed issue moving drawing within the Project Explorer. Fixed issue renaming drawings if the extension was not included. Faster Project Explorer refresh times. Fixed issue with folder sync in Azure projects. Fixed issue with source side adapters not formatting the from/to properly. Fixed issue with the status bar Grid/OSnap/Snap/ buttons randomly changing state. Modified the GPS tools to work with drawings outside the project drawings folder tree. Modified the 3D view tools to only work the the ENT product level. Modified the schema of the Cables and Systems tables. Added Vendor1 and Vendor2 fields that appear on the Assign SysName and Assign Cable Number dialogs. BREAKING CHANGES (Changes that could potentially break your plugins and require a recompile). Modified the Length field of the Cables table to support floating point decimals. Modified help file to include new GPS functions and make them context sensitive. Internal changes to supporting files and the installer. Added function to place location marker while identifying GPS locations in WireCAD ENT. Modified the map tool to place location marker while identifying GPS Location in WireCAD ENT. Fixed the map tool to honor the Backbone color settings. Added Settings button to map control. Modified Location Boundaries and Backbones that use the Line Type to display the text to honor the TextHeight of the associated TextStyle. Project Signal Types "Get Default Signal Types" function not getting LineType. We have added a new set of tools to the ENTerprise tool set to perform GPS mapping functions. Fixed issue with SysName Assignment dialog [New] button increments number by two. Modified SysName Assignment dialog to work better with SysNameFormats that involve the Location. Changes in Location now force recalculation of the SysName if the Location variable is used in the SysNameFormat. Fixed issue with SQL Azure project creation script that affected the editing of SysName and CableNo formats. Fixed issue with Community connection while connected to a SQL Azure project. Modified the Assign Cables dialog to include a Add CableTypes button. Fixed Cable Types not sorted on the Assign Cable Types dialog. Fixed major problem with drawing save after inserting a block with a signal type set to bylayer where the layer did not yet exist in the drawing upon drawing a cable. Fixed issue with Norwegian regional settings and number formatting. Fixed issue with Equipment Swap tool not updating the Equipment List in some situations. Fixed location grid throwing exception if empty records exist. Fixed issue with deactivating plugins. Fixed Exception when closing WireCAD. Fixed Object reference not set to an instance of an object when opening some drawings. Fixed Object reference error on Equipment Library open if the mainform background color is null. Fixed issue with Layers dialog not properly showing pencolor column. Modified the Locations table to include the QualifiedLocation field to make it queryable. Added Remove Duplicates function to the Locations grid. Fixed issue with Signale Types = "ByLayer" not honoring the layer color after inserting a new block from the library. Fixed issue with SysName assignment or EditBlockInPlace throwing exception while getting attached cables on some drawings. Added OSnap toggle button on main interface. Fixed Edit Block in Place not show Display Preferences options properly. Added application level setting to disable the form state persistence mechanism. Use this if you are having weird issues with 4k monitors and dialog sizing. Support multi-touch pan, rotate and zoom actions in drawing. Faster zoom and pan response. Removed the 50 character limit on the Location field. Added User fields to the Locations grid. Added GPS fields to the Locations grid. 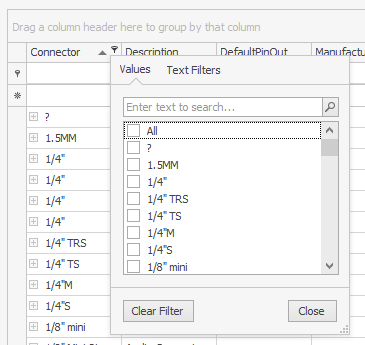 Added Excel style filters to all grids. We have started development on WireCAD v9. Please note the not all functions and features are available at all product levels. Implemented expression engine on all grids. Added support for spare cables. Added support for project level signal types. There is now a Project Signal Types grid to set signal type specific properties. This will allow you to have different projects with differing signal type structures. Modified grids that ripple to only fill the ripple list if fields of consequence are edited. Added support for background indexing. Added support for automatic indexing on Project Open and Drawing Save. Implemented natural sort on all grids and cable specific reports. No more leading zeros to get the sort right. Implemented quick index based ripple (if indexes exist) with option for full ripple. Added sync equipment insert to database function. If the equipment gets out of sync it can easily be recovered. Added Refresh all Pointers on Insert function. Now you can easily update all of the on sheet/off sheet pointers on a selected insert. Added Equipment Swap function. Now you can select a piece of equipment to replace another and decide which ports map over. Added Link Selected Pointers function. Now you can select a group of pointers and assign them in bulk on the same sheet or across sheets. Modified the Software Development Kit (SDK) with new examples. Added more samples to the SDK and a Visual Studio project templates installer. Now it's easy than ever to customize WireCAD to fit your needs! Modified the SDK to allow developers to modify their assemblies and recompile without relaunching WireCAD. Modified the SDK with 4 new events to apply rules. Implemented rules engine using the new expression engine. In addition to the SDK Rules events there is now a project Rules grid where you can define rules that transform data as assignment are made. Modified the help system to tie all dialogs and forms to context sensitive help. Created a Beginner Mode setting that initiates help to track your moves and provide context sensitive help. You can disable this in the user settings. Added support for pinning forms in the interface. Added form state and position persistence. Now popup dialogs remember previous position. Modified block creation to place block body on a unique layer then set the pencolor to that layer. This will allow changes in body color after creation. Modified all block generated text to honor the TextStyle Height property allowing for changes in text height after block creation. Modified the plugin integration so the wpi files now reside in the common WireCAD folder for easier editing. Modified the Application Settings section to allow enable/disable plugins. Added Grid, Snap, Polar, Ortho, Extension Tracking to the status bar. Added context menu to tab items allowing different close choices: Close This, Close Others, Close All. Editing SysName or Terminal now automatically refreshes pointers. Modified report cable data selector grid to allow multi-select. Modified the Equipment Library dropdowns for units of measure, weight values, power units of measure etc. to inherit their data from comma separated list values in the translation manager. Increased load speed of Link Pointers select drawing form. Added setting to show reports in Project Explorer, Reports Gallery or both. Removed the Inserts gallery from the CAD Tools toolbar to speed up drawing switching and facilitate loading very large drawings. Introduced a top to bottom sort on all selection sets. Enhanced speed of the Reset Selected SysNames function. Enhanced speed of the Reset All Cables function. Added two new events to the SDK - ActiveDrawingBeforeLinkPointer and ActiveDrawingAfterLinkPointer. Added Draw Text dropdowns to the Terminal to Point and Point to Terminal draw cables tool panel. Deassign Cable function now crosses Pointers. Added new Delete Handling option to delete all attached cables when deleting equipment. Added new Delete Handling option when deleting a cable attached to a pointer the other end cable can be reset. Added Expert Mode to avoid common explanatory dialogs during function execution. Added drawing regen after Rereference Pointers function to show changes immediately. Modified PlanView Draw Backbone tool to work with inserts and location boundaries. Increased community server load speed. Added Plot control to Layers dialog to allow selection of layers to include/exclude in printer and PDF export operations. Moved the Batch Plot menu item to the Projects tab. Modified Batch Plot to remember printer setting with plot file. Modified Batch Plot to support multi page PDF output.